Since reading about Coconut oil I’ve been curious how it compares with other oils, which also have many benefits for human health. For example, Flaxseed (Linseed) oil is rich in Omega-3 and Omega-6, which may help to lower cholesterol, protect against heart disease and control high blood pressure. There is more to it! Apparently, Coconut oil extracted under cold and hot conditions differ in qualities. It is the common belief that virgin coconut oil extracted under cold conditions preserves several thermally unstable antioxidants and, as a result, better beneficial qualities can be expected from the cold virgin coconut oil. “However, high temperatures used in the hot extraction of coconut oil favour the incorporation of more thermally stable phenolic antioxidants into coconut oil.” (Food Chemistry, Volume 114, Issue 4, 15 June 2009). It seems, we need to aim to consume Coconut Oil extracted at higher temperature to improve antioxidant related health benefits. How? Not really sure. I have only used Macro Organic Virgin Coconut Oil, which is “Unrefined Cold Pressed”. 2. Equally and evenly distribute the almond meal in the bottom of ramekins. 3. Combine coconut sugar, cinnamon and cloves in a dry mixing bowl. Peel, core and coarsely cut the apples into the sugar mixture, mix to make sure all apple pieces are covered evenly. Divide apple mixture between the ramekins. 4. Combine flour and Stevia in a dry mixing bowl. Add coconut oil and incorporate using the tips of your fingers until mixed like coarse breadcrumbs. To find unincorporated coconut oil, just shake the bowl and they will resurface. 5. Mix flaxseed oil and water and add to the crumbs, thoroughly mix again using your fingers. To check if the crumb mixture is ready, squeeze the crumbs in your hand. Then, if the mixture stays together, It is the rigth consistency. 6. 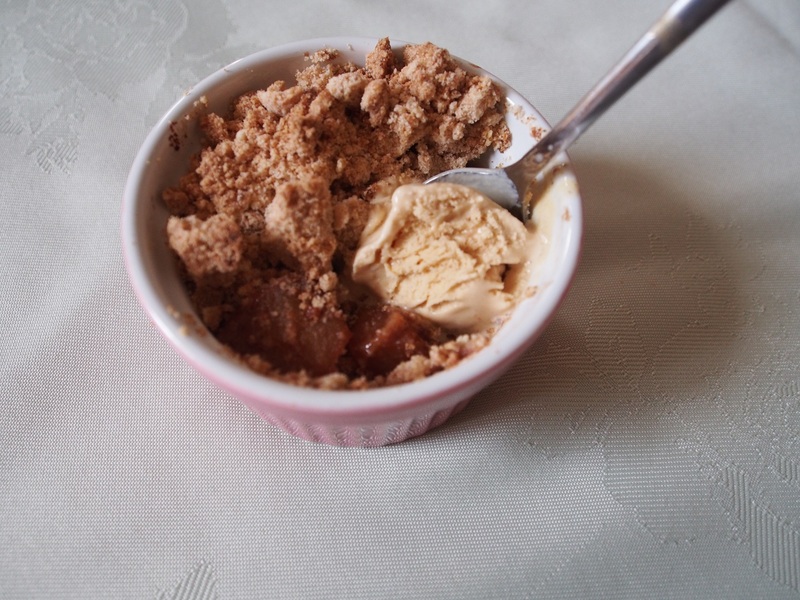 Use the above technique to transfer Crumble pieces and top the apples. 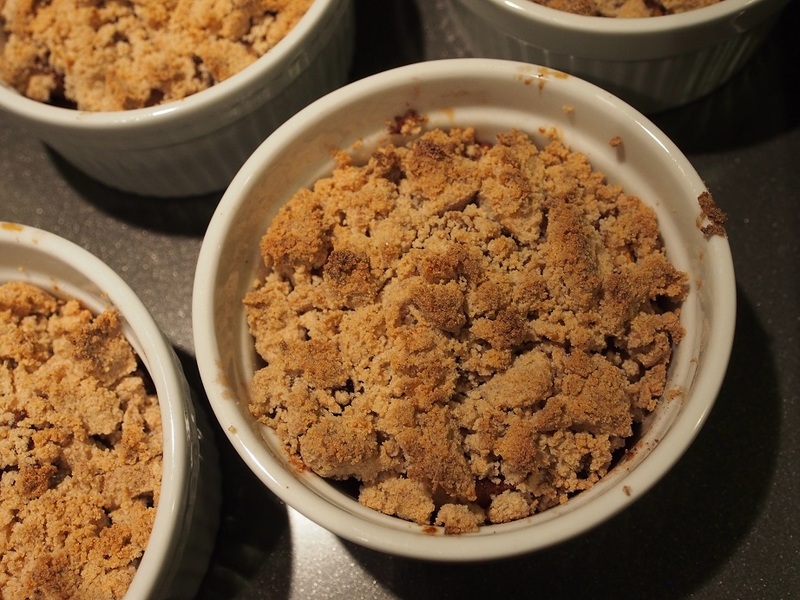 Bake in the oven with no fan for 25 minutes for small ramekins, or 30 minutes for large ramekins at 180C, until the Crumble starts to brown. 7. Allow to cool for 5 minutes then serve with coconut ice cream.